The summer break from school and yeshiva is a marvelous opportunity for our kids to de-stress, explore the broader world around them, and bond with their families and friends. Of course, the very different framework from their school-time routine, involves certain risks, and our job as parents is to balance the important “escape” experience, with safety. This presents all parents with a great moment to sit down with our kids and discuss safety. Right now, before we get distracted! This needs to be done at a level that generates concern (so they will act upon the advice you give them) without creating panic (which could freeze them, or just lead them to hit the “skip this!” button). We suggest that you broach the subject by talking (say) about the risks of the hot climate – dehydration, sunburn, etc, and the importance of wearing hats and drinking lots of water. The risks involved in swimming – and reinforce the importance of swimming where there is a lifeguard. Along with physical safety, discuss with them, in the same tone, about sexual safety. This will need to be varied by age and ‘worldliness’ of your children. 1. Good touch, bad touch & confusing I-Don’t-Know Touch. That our kids’ bodies are theirs and they must say No when they feel uncomfortable, and move away. It is Not impolite – it is the right thing to do. 2. Good and Bad Secrets. Good secrets can be that there’s a birthday surprise being prepared for Ima. Bad secrets are generally not time-bound, involve a gift/incentive, or threat, and are about being scared. Most important, if someone says “don’t tell you parents!” this is a red light, and our kids must immediately tell their parents, or another trusted adult. 3. Most kids don’t tell if they have been abused, because they think they won’t be believed, or you will be angry with them. It is important to constantly re-enforce that you will always love your kids and you encourage your kids to tell you what’s going on in their lives, even if it’s not stuff you’re likely to want to hear. For example, “I cheated in my math test” should be greeted with “thank you for telling me”, before exploring why your child cheated and how to avoid this dishonest behaviour in the future. This gives your child the message that he/she can tell you other things that are on their minds. It is important to teach your children about Stranger Danger, including “always tell me if someone gives you a present; I simply need to know about it”. Many kids are lured into secluded places by abusers with "please will you help me…?". Therefore, educate your kids that “kids don’t do favours/mitzvos for adults – ADULTS do favours/mitzvos for adults”. Help your kids to practice saying “No, I'm sorry I can't help you; please ask an adult to help you”. Even more important, is telling them that most kids who are hurt by an adult, are hurt by an adult they know and trust. This is difficult for kids to internalize. For that matter, it’s very difficult for adults to internalize this also. Uncles, baby-sitter, teachers, camp councilors, frum people…have the same rules as the rest of society. And if they seem to be going over regular behaviour boundaries – this is unacceptable, and they must be stopped (however uncomfortable or ‘impolite’ this is). And always, always listen to your kids. It’s easy to ignore what they’re trying to tell us. Tune in to their wavelength – AND HAVE A GREAT SUMMER!! MK Yisroel Eichler is complaining about the Home Front not preparing gas masks for men with beards. I don't know the feasibility of such a thing, as people's beards can be so different, whether wide and bushy, or very long or very wild, that i can see it being very difficult to make a mask that will include a persons beard with risking the breaking of the seal. However, if it is possible, of course it should be done. it is not like people with beards are uncommon in Israel. 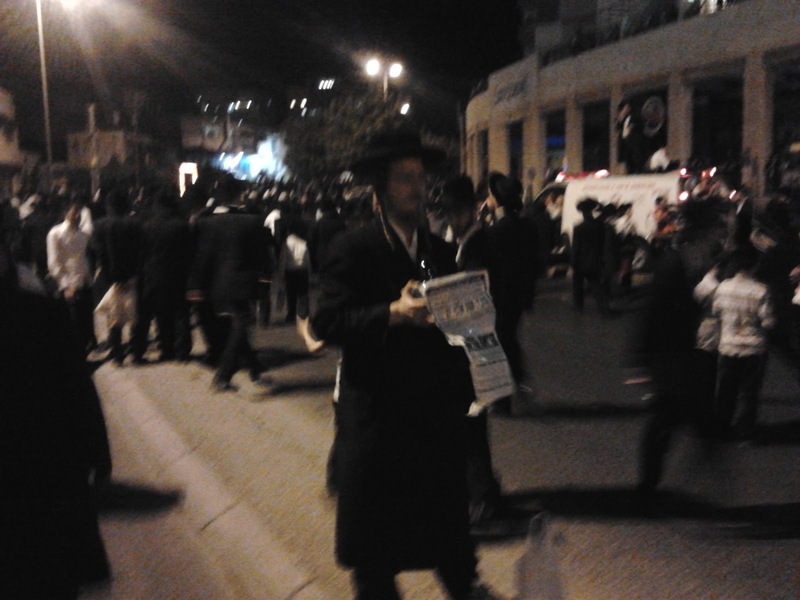 What is more interesting is his complaint that gas masks are not being distributed in Bnei Braq. This reminded me of the way they brag after any time of danger and bring up the old promise of the Steipler that rockets and missiles will never fall in bnei Braq, because they are protected by the Torah. Rav Chaim Kanievsky, the Steipler's son, was quoted during the Gulf War as sayign that there is no need to use gas masks, let alone to cut off one's beard for the fitting of the gas mask, because gas masks are not needed in bnei Braq due to the promise of the Steipler. Of course they must prepare and get gas masks, and do their hishtadlus. Just wondering if bitachon is only to be expressed after the fact or even in advance. if one professes to have that level of bitachon that gas masks are not necessary, that bitachon is not being expressed when it comes in the form of bragging after the fact that it was not needed. the bitachon is expressed in advance by saying we will not need it. One of the threats regularly used by the haredi community when it is upset about something is an economic boycott. I think that is totally legitimate, but once actually must hold the power it thinks it holds for this threat to be effective. 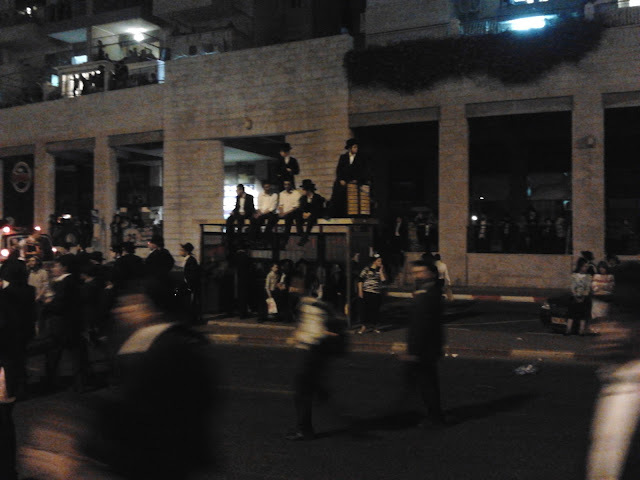 I dont know if the haredi community really holds such power or not, but they use the threat often. One time it seems to not be helping is in the fight against the cultural events being held in Mahane Yehuda shuk in Jerusalem under the name of the Baale-Basta. As mentioned last week, the Eida is banning, or at least encouraging people to avoid, the shuk for the duration of the events. To my surprise, the merchant committee of Mahane Yehuda did not come out apologetically pleading for the business. They could have said something like the Iryah is doing this, not us. We have no power, please, etc. etc etc. Instead, according to Bechadrei, they have decided to call the Eida's bluff. or maybe they are just taking them up on their offer. They have come out swinging. The merchants committee responded to the news of the Eida's announcement by saying we don't need them here then or at all even the rest of the year. The chairman added that the events of the Baale-Basta present no tzniyus issues any worse than at any other time of the year or any worse than anywhere else in Jerusalem. Furthermore, it is most likely that they (the Eida community) do not even shop here all that much in the first place. And if they do, if I am wrong, they probably will not stop shopping here because of this. 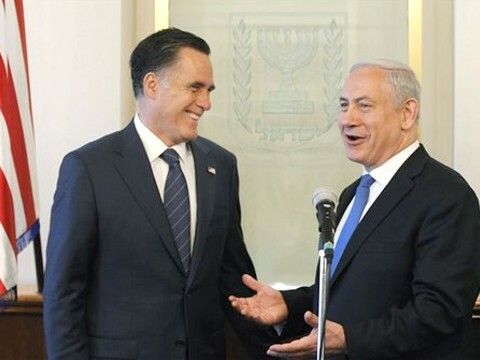 The Prime Minister's office and various spokespeople in the Foreign Ministry and others have been putting out statements defending, and perhaps justifying, the welcoming of Republican candidate Mitt Romney to Israel and for having meetings with him. The need to justify and defend these meetings is so that it will not appear as if t Israel is "meddling" in internal US elections, nor taking sides or showing preferences. The statements being put out mostly consist of saying that we welcome Republican candidate Mitt Romney to Israel and are meeting with him just like we met with the Democrat candidate 4 years ago when he visited Israel during his campaign. I think a better statement to release would have been something to the effect of "We welcome the visit of Republican candidate Mitt Romney and will be meeting with him, just as we would have met with the Democrat candidate if he would have chosen to visit Israel".. This Tisha B'Av, as we commemorate the destruction of both the first and second Temples and other tragedies that have befallen the Jewish people on this day throughout history, the Producer of the documentary film, UNSETTLED, has decided to make his film available for free online streaming at www.vimeo.com/46423843. UNSETTLED is a powerful and emotional documentary about the internally polarizing and extraordinarily dramatic event Israel faced in August of 2005, which has become known as the disengagement from the Gaza Strip. This film offers a unique and personal behind-the-scenes look, both before and during the evacuation, at the people whose lives would forever be impacted by the events which unfolded during those difficult weeks. UNSETTLED - Documentary on the Disengagement from Gaza from Gaza Withdrawal on Vimeo. Jamie Geller, of Joy of Kosher, recently made a dramatic announcement that she and her family will be making aliyah this summer (and moving to RBS). Since then she, in cahoots with Nefesh B'Nefesh, has been videoing her aliyah preparations and turning it into a series called Joy of Aliyah. In this episode, the container for their lift gets filled and they make the final preparations for aliyah..
For a variety of reasons, posting will be light, if at all, this coming week. Looking forward to seeing you all back here after that! With the Olympic Committee refusing to hold a minute of silence in memory of the victims of the Munich Massacre, many are holding their own spontaneous commemorative moments of silence. This was in the House Of Representatives this morning. There is talk of an impromptu moment of silence to be held at the Olympics by the crowds. today will be a double quote of the day, from both the Prime Minister and the Finance Minister talking about the upcoming tax hikes. Even after the steps that we will take, the families in Israel, the middle class and the weak sectors, will end up with more money in their pockets.. I remind you that within a few days we are bringing forward the law of free education from the age of 3 - hundreds of thousands of families will save 800 NIS per month. We brought tax credits worth up to hundreds of shekels a month for working families that went into effect in January 2012. We already brought about a serious reduction in cellular phone bill prices, and we brought about free dental care for children up to the age of 12. This is a major change that in the end will have most citizens of Israel with more money in their pockets. We are here to protect the economy of Israel. We see what happened in the USA, in England, in Spain, and Greece, and we won't allow that to happen here. The most important social thing is, in addition to all the steps that we have taken during the past 3 years, in that instead of creating 160,000 jobs, the economy flourished and we were able to create 330,000 jobs. twice the norm. A law proposal has been in the works to promote live organ donation, and to encourage the public to register as donors. The law proposal would put anybody who is a donor to the front of the line in case, God forbid, he or she should need an organ donation. Yesterday the Knesset approved the final readings of the proposal. The law will give priority to organ donors, whether they have donated to a random recipient or even if they have donated to a specific recipient. until now donating to a specific recipient did not give the donor any priority or personal benefit. As well, Anybody who donated prior to the passing of this law will also be included in the benefits of the priority. This is an important law. Israel is low on the list of organ donation, and if this can succeed in interesting people, even if just as a form of insurance, to become donors, it will have been worth it. Many people object based on religious grounds, and this will not change that. But for people who do not have a religious opposition to organ donation, either because they say it is allowed from a religious perspective or because that perspective doesn't interest them, this can possibly be the catalyst to increasing the donor ranks. This video put out by the Temple Institute has been online for just a few days and already has nearly 200,000 views. That is viral, at least by Jewish content standards.. Pretty good video content, awesomely filmed and set, in my opinion. The Egyptians, though, of all people, think otherwise. I had expected to possibly hear some protest from the Palestinians, and maybe even from the Jordanians. But the Egyptians? According to this report on NRG, the new president of Egypt, Mohammed Morsi, is upset and the video and considers it a provocation. In the newspaper held by the adult, and dropped near the end of the clip, bears the image of Morsi. Morsi claims that the message transmitted is that Israel plans to build the Temple to the indignation of Morsi. 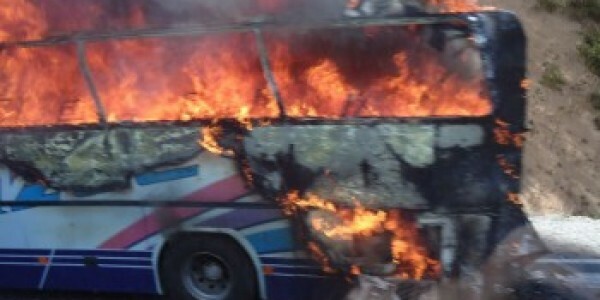 Morsi has instructed the Egyptian Foreign Ministry to prepare a response. Anyway, since this video was not put out by the Israeli government, he should really just be ignoring it. Nothing the Temple Institute says or does, no matter how much I like them and the work they do, is binding on the Israeli government nor is it representative of the Israeli government. one can appreciate the content, one can enjoy the content, one can dislike the content, but at the end of the day it should not be the cause of a diplomatic incident. oops.. MK Yisroel Eichler (UTJ) slipped at the Knesset podium. While talking about how evil the people are who are trying to draft the haredim, Eichler makes mention of Rav Elyashiv and says "at the funeral of Rav Elyashiv, shlita".. Shlita is used for living people, not the dead.. an honest mistake, but still made me crack a smile..
More participants in the Jerusalem campaign..
Driving can be pretty dangerous in Israel. Heck, even being a pedestrian can be pretty dangerous. Somehow, the police never seem to be where the crazy drivers are. The latest app coming out of Israel to hit the market is one by which anybody running the app can record the details of a traffic violation, including taking high speed images of the incident. the app will then upload the data to the company website where it will sit for a week. During that week it will be visible to the pubic and they will be encouraged to analyze it to see if something illegal was actually done. If the votes determine that a violation had occurred, the information will be forwarded to the police. I seem to remember that a large part of how Ronald Reagan brought the Soviets to the knees in the '80s was via the Star Wars program. An arms race was created in which the United States and the Soviet union competed to see who could spend more money than the other on weaponry, satellites, and the like. Eventually, the US was able to out-buy the Soviets, and essentially bankrupted the Soviets into collapse. It seems like something similar is happening with Iran. While one can never be completely sure what is true and accurate regarding news coming out of an oppressive regime, the other day there was a news item about how in Iran they are censoring ads on television - the specific situation was an ad for wholesome food and among the items it had a chicken waiting to be cooked. They said the chicken had to be removed because the image of the chicken would cause great anger. Why? Because poverty has gotten so bad, because of the sanctions, that many people cannot even afford to have chicken in their meals. true or not, I do not know, but that was the news item. So on the one hand there is horrible poverty due to the effectiveness of the sanctions. On the other hand we have regular reports of how the government is pouring more and more money into their nuclear project. Such as today the news is reporting that Iran is now adding another 1000 centrifuges for enriching uranium. So, people dont even have money for chicken, and its so prevalent that they have to ban such images from the television, but they have money for their nuclear project. And they continue to pour money into it despite other needs being perhaps more pressing and urgent. Perhaps Iran is on the road to an economic collapse, similar to that of the Soviet Union, which can lead to the end of the regime..
As the Baale-Basta festival is set to begin for the summer evenings, with performers and events happening in the Mahane Yehuda shuk, the Eida is calling for people to avoid going to Mahane Yehuda in the evening hours after 5 PM, between 13 Av (August 1) and 13 Elul (August 31). On the one hand the pashkevil placed by the Eida declares that because there are alternatives (one can buy in a store rather than the shuk), it is prohibited to go to Mahane Yehuda, while on the other hand they only say that people who can should avoid Mahane yehuda and not go there to buy. So if it is assur or just recommended, I am not sure. The problem with the Baale-Basta, as per the pashkevil, is that they are hosting events with the worst kinds of pritzus. I must say, these guys have little imagination if some musicians performing and women wearing short sleeves and jeans is the worst pritzus possible... Anyways the women come dressed like that on any given day of the year, so the only thing different is that there will be music. Perhaps there will be women singing, which is a legitimate problem. The Eida call to avoid the shuk after 5 PM is, I think, even reasonable. They didnt boycott the shuk, as I would have expected. Just saying that after 5 the atmosphere is not one people from the haredi community want to be exposed to. the question I have is what happened to the idea of opening a new mehadrin shuk in a different part of Jerusalem? 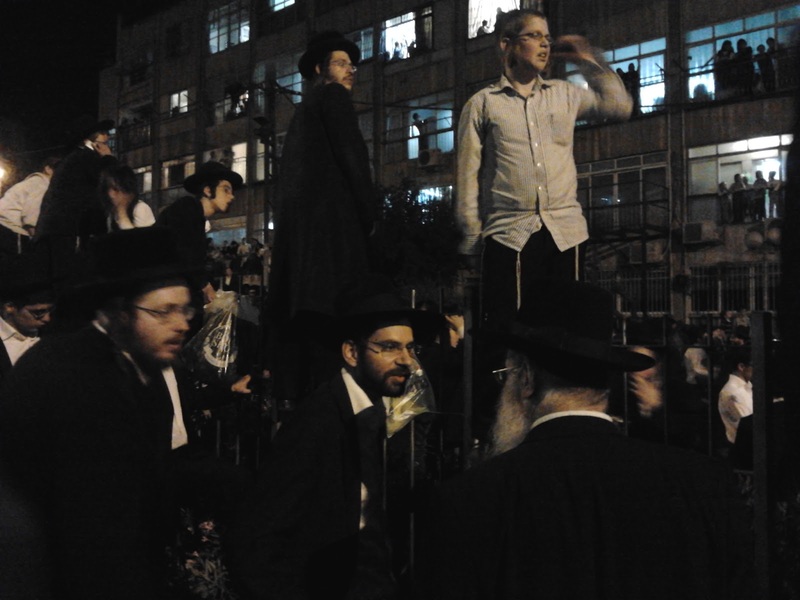 When the Baale-Basta festival began last summer, the Haredi reps decided they would work towards opening a new shuk, so the haredim would not have to deal with these performances and conflicts. They even announced at some point that they had located an appropriate property for their new shuk. Since 1980 the “Livnot U’Lehibanot” – To Build and Be Built – Israel Experience Program has been offering opportunities for young Jewish adults to explore Israel through hiking, volunteering, archaeological excavations, experiential seminars and workshops with local artists and scholars. Programs run as one-week post-Birthright extension options as well as four-week Israel Experience alternatives. Each program involves intensive encounters with Israeli life, the people, the Land and Judaism. Livnot gives participants the opportunity to grapple with different issues and questions about Jewish history, beliefs and philosophies as well as to explore Israel’s place in the Jewish World. The goal of Livnot is to provide participants aged 21 - 30 with an open environment in which they can delve into different aspects of Judaism while experiencing an immersive living experience within a Jewish community. Livnot is not a “religious” program. It presents different aspects of Jewish beliefs and ways of life that allow each person to consider their own connection to their Jewish heritage and to the Jewish World. “I felt as though I learned more about myself and Judaism by doing Livnot after Birthright then I had my entire life growing up in the states. It's an atmosphere of where they encourage questions, candor, and discovery. Best of all, what you find through the program is totally up to you, whether you're looking for a week packed with hiking and cave exploring, or to dive into the spirituality that is Tzfat!” J.L. “I’m here in Tzfat now with Livnot. For a post-Birthright program, or for a way to spend a month in Israel wisely, Livnot is definitely the way to go. Amazingly talented and dedicated staff, great people. We just got back from an overnight hike in the desert it was incredible.” S.K. “As far as extension programs go, Livnot was absolutely amazing. I got to enjoy the benefits of a program without feeling suffocated, and it was more than just sight-seeing. My week there was definitely one of the high points for my trip.” J.E. With summer vacation upon us, you can consider this post to be a public service announcement. You can either think it is a great idea, and try to incorporate it into your upcoming vacation plans for hiking through the Golan Heights, or you can think it is absolutely insane and stay as far away as possible. According to this report in The Times of Israel, the hot tourist attraction up north is the border with Syria. Tourists are going to the area of the border so they can hear, and sometimes even get a glimpse of, the fighting on the other side of the border between the Syrian government and the rebels. It all started when images were released of Defense Minister Ehud Barak watching the fighting from a location in the Golan. After that, people started flocking to the border area to try to get a glimpse.. Here are some more clips that have been made as part of the campaign stating jerusalem is the capital of Israel. I was just reminded of the following incident that happened less than 6 months ago. The fellow donated a year, but Rav Elyashiv only continued to live another 5+ months. Not a very effective donation. He lost a year of his own but only 5 months were gained. I was reminded of this because of the Bechadrei report on the nichum aveilim visit by Minister Silvan Shalom to the Elyashiv house. When Shalom walked into the house, one of the sons of Rav Elyashiv introduced him as the person who extended Rav Elyashiv's life by 9 years. He went on to explain that in 2004 Rav Elyashiv had been very ill and a specialist needed to be flown in from the USA, along with obtaining and clearing certain special medical equipment that could not be obtained privately for technical reasons. Silvan Shalom, in his capacity at the time as Foreign Minister, had been approached, and quickly made all the arrangements and was able to get whatever was necessary for the treatment. When Rav Elyashiv recuperated from his illness, he sent a message to Silvan Shalom that he'd like to see him. When Shalom came down to Hanan St. for the visit, Rav Elyashiv thanked him profusely for having helped. Silvan Shalom brought in a doctor and medical equipment and added 9 years to Rav Elyashiv's life, while the avreich donated a year and only got 5 months out of it... Which was more effective? 1. Still Not Self-Sacrifice - Reb Akiva's daughter writes more about her decision to serve in the Israeli army. 4. Was The Kotel Ever Covered With Garbage? 5. baseless Hatred or Principled Policy? Ben Gurion did not fight against the religious, but against turning the religion into a mechanism. Ben Gurion saw himself as a religious person. As a statesman he was greater than all the rest, he never made a mistake, and his way led to the establishment of the State. The union was the template of the State. in his fight with Jabotinsky, history has shown that Ben Gurion was correct. He always credited success on the general community, but failures he blamed himself for. As reported recently in the news, and mentioned on this blog, some Jewish neighborhoods have been fighting with neighboring Arab villages regarding the regularly increasing volume of the muezzin that is disturbing Jewish residents at all hours of the day and especially of the night. Some of the neighborhoods administrative committees have threatened to retaliate with acquiring massive speaker systems and having them face the Arab villages, and hard rock music would be played over them. The news is now reporting that the Arabs have backed down in light of the threats and have agreed to remove the speakers facing the Jewish neighborhood. Can we achieve peace by using similar negotiating tactics? Rabbis from Tel Aviv, including the Tel Aviv Chief Rabbi Yisrael Meir Lau are encouraging people to be concerned for the environment and protect it for future generations. 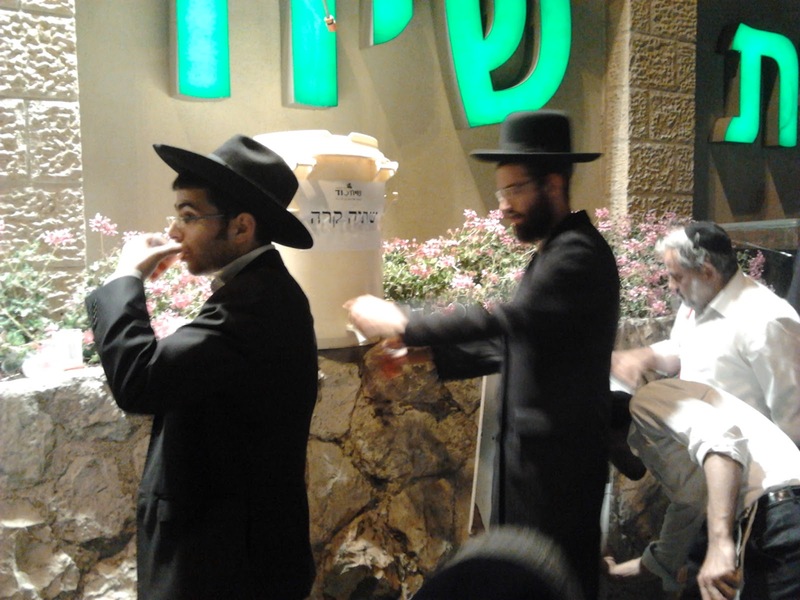 The city has created an initiative for people to separate their garbage, and the group of rabbis signing on the letter of rabbinic approval even say that because some of the garbage has value and can be recycled, disposing of it without separating the items would even be considered bal tashchis. US President Barak Obama has indicated that if he were to win a second term as president, he would come to Israel during that second term. One of his men, a former assistant, said in a call to reporters, as reported on CNN, that Obama would visit should he be re-elected. Presidents of the USA do not have any obligation to visit Israel. The last few presidents have done so, but most presidents since Israel's inception have not. With the extensive travel itineraries around the world, one would think that a stop in Israel, both one of the top allies of the USA, especially in the region, and a major center of international politics and discussion, would be automatic but not just out of de rigueur but out of necessity of involvement. However I don't see it as a major necessity. I prefer the president focus on improving the relationship, working for the safety, even working for a peaceful settlement of hostilities, more than I care to see him make a meaningless trip to Israel where we will fall over backwards to pander to him and create massive traffic jams so a little girl can hand him flowers in Jerusalem. I don't belittle that, as it creates goodwill, but I don't see it as a big deal if it does not happen. Anyways, the last time Obama visited Israel, as a presidential candidate, we made sure to embarrass ourselves pretty nicely when someone had the gall to remove from the Kotel the note that Obama had stuck in the cracks.. If he comes again, let's try to keep it together and not do stupid things to embarrass ourselves..
Are the Iranians getting soft? After years of refusing to compete against Israelis, or stand alongside Israelis on a medal stand, in international sporting events (such as the Olympics), this year Iran has changed it's tune. Late breaking news update: Iran is now denying the report that they are willing to compete against Israel. They still don't want to be shown up and beaten by the Israelis, so they continue to refuse to play..
Iranian media slammed a report quoting the chairman of the Iranian Olympic committee as saying that Iranian athletes will compete against Israelis in the London Games. Amazing how violent they get when they think the station is Israeli..
Justice In the Good Old Days..
We have seen recently in the Kadima party that some of the people will have the job of deputy minister. I do not denigrate the position, but these are people who have not been MKs for long enough. Slow down. Do we need so many ministers and deputy ministers? Do we need this culture that anyone can be bought all the time, as long as we dismantle the opponent? You will see, the day is not far that a Minister With No Portfolio will be assigned a Deputy Minister With No Portfolio, in order to waste our time and our money..
As reported last week, after the Plesner Committee disbanded and its recommendations were rejected, Shas worked to thwart a resolution for the hesder yeshivot. The DL came up with an easy solution that would separate the yeshivot hesder from the general yeshiva system, thus allowing the hesder yeshivot to remain open and not be dependent on any new law replacing the TAL law, or suffering due to the lack of a replacement law. SHAS announced that they opposed the solution, and they considered it unacceptable to find a solution for some Torah learners while others still have to worry about their future. In the ministerial committee's discussion yesterday about the appeal to the proposal, SHAS decided to withdraw their opposition. According to this report on Srugim, SHAS realized that HaBayit HaYehudi had a majority of votes supporting their proposal and the opposition by SHAS was going to fail. SHAS withdrew its opposition, thus paving the way for what is expected to be quick legislation to get this resolved before the Knesset disbands for vacation. I am not sure why they withdraw their opposition just because in a vote they would lose - is there a law saying votes must be unanimous? does it look bad to lose a vote? If they really oppose it on principle, why not continue opposing it even if it would not succeed in preventing the law? Isnt that what principles are? However, since the initial opposition seemed more like vengeance and pettiness rather than idealed principles, the withdrawal of the opposition is welcome. The political bribery of creating unnecessary ministries in order to create high paying positions in which to place people who are willing to work with you, and unnecessary deputy ministerial positions as well, is bad enough, but is perhaps a necessary evil. Do we really need 30 ministers and 10 deputy ministers? Salaries, benefits, pensions, etc.. all just to placate some people and "buy" their support - but that is politics.. A guy like Nachman Shai, as good a guy as he might be, has the power to demand support for a mayoral bid in Israel's largest city, it's capital? Or, alternatively, an ambassadorship? What has Nachman Shai done since he entered politics that makes him such an important player to be courted? Tzachi Hanegbi left the Likud with a bang to create Kadima with Ariel Sharon. since having been convicted of corruption, brings what to the table besides for political thuggery? It's bad enough that the government has to pay so much to get people off the sinking ship of Kadima, but to court such people and throw them a political lifeline is almost abhorrent.. They should be left to go down with the sinking ship. A campaign has begun in response to the BBC refusing to list Jerusalem as the capital of Israel on its Olympics website.. the campaign to keep publicizing Jerusalem as the capital includes the Israeli Olympic athletes mentioning it repeatedly in their interviews..
3. Gaga hits the new York Times... must've been a slow day..
8. Does Such a thing as "posek ha'dor" exist? How Much Of An Anti-Zionist Is the Vizhnitzer Rebbe? Every single event has it's own edition of Kamtza and Bar Kamtza, whether Hassidic, Litvishe, Modern Orthodox or whomever else might arrange an event. Someone is sure to say that he can't attend because he cannot sit alongside a different rabbi whose name appears on the guest list. It is interesting that this refusal to participate is happening during the 9 Days. Anshel Pfeffer of Haaretz has written a nasty article about Rav Elyashiv, written practically before the body was even cold. According to Pfeffer, Rav Elyashiv's legacy was an "empty one" and it seems that the only thing Rav Elyashiv was good for was encouraging high birth-rates, freezing progress in time and keeping members of the community from leading productive lives. Pfeffer is judging Rav Elyashiv by the wrong barometer. Pfeffer seems to have had unrealistic expectations of Rav Elyashiv as a leader. It seems that Pfeffer expected Rav Elyashiv to lead the haredi community according to standards and expectations set by Pfeffer himself along with those of the general community. 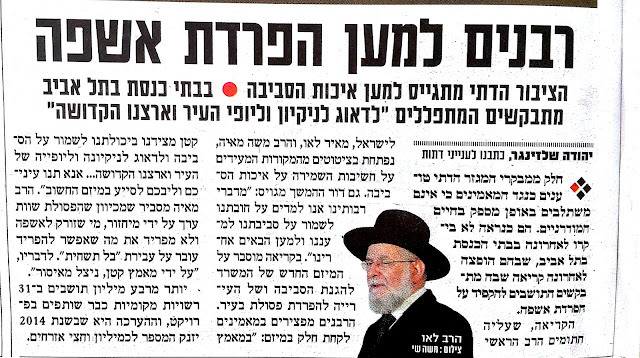 According to Pfeffer, because Rav Elyashiv did not move the haredi community to be more in line with the general public, he was a failure, his was an empty legacy. 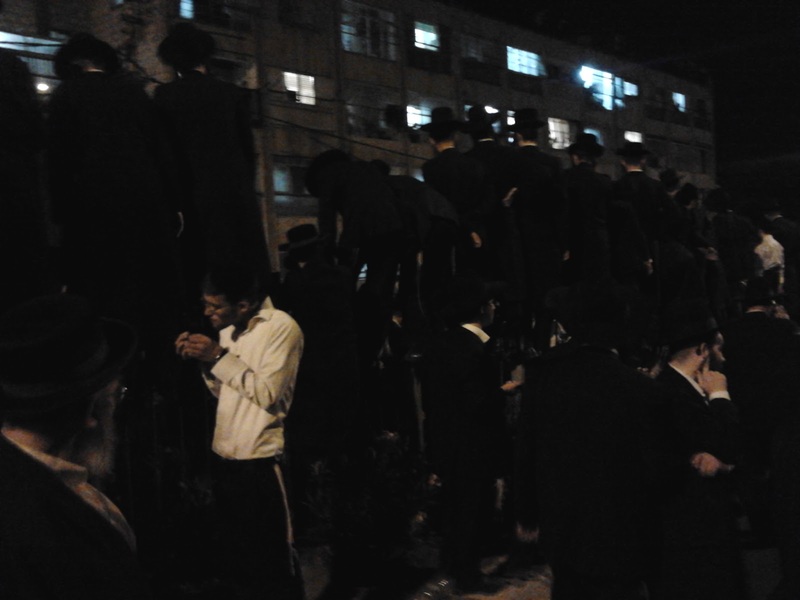 The problem is that the haredi community does not want to find a way to move in line with the general public. The haredi community does not choose it's leaders, whether they be political leaders or spiritual leaders, by their promises or stated abilities to lead the community towards modernization. That is neither a goal of the haredi community nor is it something the haredi community is interested in. The haredi community wants to stay separate, and its leaders operate under a different set of guidelines and priorities than do the secular or more modern religious communities. One can argue and debate the ideas and philosophies, one can even criticize decisions made. However, the only way one can call Rav Elyashiv's legacy to be an "empty legacy" is by not having any understanding at all of the haredi community, and by looking at it from the wrong perspective. The haredi community does not consider Rav Elyashiv's legacy to be an empty one - far from it. Powerful Jews or Abhorrent Anti-Semites? I am not quite sure what this program has to do with the Jewish community specifically, that it should be a problem that requires attention, but I guess Louis Farrakhan and the Fruit of Islam are both so off-limits that making any arrangement with them needs the approval of the Jewish community. 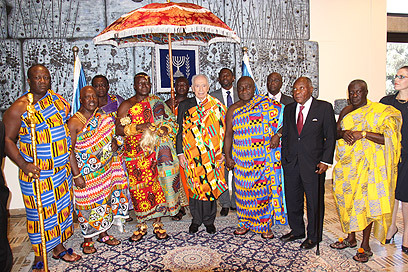 Otherwise, without getting such approval from Jewish community leaders, any cooperation with these people, known anti-semites, even on issues having no bearing on the Jewish community specifically, will make the organization working with them look really bad, as choosing a partnership with the devil. Crime has gotten so bad in Chicago, with a 40% hike recently in homicides, that city and police officials are welcoming the offer of help from Farrakhan and his Fruit of Islam. “Whatever we can do to help stop violence, I’m for it — no matter who it comes from. Just like CeaseFire. They have ex-offenders helping to stop the violence. It doesn’t matter, as long as we can stop people from getting killed,” said Ald. Walter Burnett (27th). Ald. Leslie Hairston (5th) said she is “in regular conversation” with the Nation of Islam about summer events and looks forward to talking to Farrakhan about his plans to bring 500 Fruit of Islam members to South Shore, duplicating Monday’s show of force in Auburn-Gresham. “They are extremely well-organized. They are known for their discipline. That brings attention to the community,” Hairston said. Chicago Sun-Times columnist Mary Mitchell reported Thursday that black men in dress suits and bow ties fanned out across violence-plagued Auburn-Gresham on Monday night to form a human wall of protection against any sudden outbreak of gunfire. The army of men, know as the Fruit of Islam, were led by 80-year-old Farrakhan, who ordered the show of force in response to last month’s murder of 7-year-old Heaven Sutton. After knocking on doors and filling the streets with images of hundreds of black men determined to keep the peace, the Nation of Islam said it plans to leave a small contingent of men in the area to work with community leaders and do the same thing next Monday in South Shore. The Fraternal Order of Police was dead-set against the city’s decision to forge a $1 million partnership with CeaseFire, a Chicago-based anti-violence group that sends felons into the streets to mediate gang conflicts and stop shootings, but refuses to share information with the police. But, FOP spokesman Pat Camden said the police union has no such qualms about accepting help from the Nation of Islam. “The last time I checked, Fruit of Islam isn’t convicted felons, are they? That’s a huge difference. And they’re not getting paid by the city,” Camden said. Mayor Rahm Emanuel took a similar stance. Although Farrakhan has a history of making anti-Semitic statements, sources said Chicago’s first Jewish mayor has no interest in revisiting that controversy. Instead of resurrecting old wounds and past political divisions, Emanuel’s singular focus is to reduce a surge in Chicago homicides that’s become a media obsession and threatens to undermine the mayor’s efforts to market Chicago to international tourists. “Everyone has a role to play in reducing violence. We all must do our part to make sure our communities are safe,” the mayor’s communications director Sarah Hamilton said Thursday, reiterating the mayor’s mantra that Chicago Police can’t do it alone. Ald. Debra Silverstein (50th) agreed with the mayor — with a caveat about Farrakhan. “It’s good that he’s helping in the fight against crime but it doesn’t eradicate the comments that he’s made about the Jewish community,” said Silverstein, an Orthodox Jew. Emanuel’s efforts to steer clear of Farrakhan’s history of anti-Semitic remarks is a far cry from the 1994 controversy that followed former Mayor Richard M. Daley’s private meeting with Farrakhan. During the meeting, Daley prodded Farrakhan to work out his differences with Jewish leaders in talks arranged by the Commission on Human Relations. Daley even hinted that, if those conversations did not take place, the Nation of Islam would have trouble winning the city approval needed for its planned development along the 79th Street commercial strip. Jewish leaders refused to engage in the dialogue. They were so concerned about the mayor’s private meeting with Farrakhan, they demanded an audience of their own to clear the air. Daley used that meeting to deny ever suggesting the give-and-take. “There’s been a rather longstanding pattern where Minister Farrakhan has talked about wanting dialogue. There have even been a couple of instances where members of the Jewish community have met with him,” Michael Kotzin, director of the Jewish Community Relations Council, said at the time. Interesting that they should need Jewish approval to get assistance fighting crime in non-Jewish neighborhoods... Is that indicative of how powerful the Jews have become or how bad of a person (and organization) Louis Farrakhan is? I suspect the latter. Yehiel Spira, from Jerusalem Kosher News, has been advocating for a long time about increased awareness regarding issues of kashrus. One of the main issues he tries to raise awareness about is events in simcha halls. 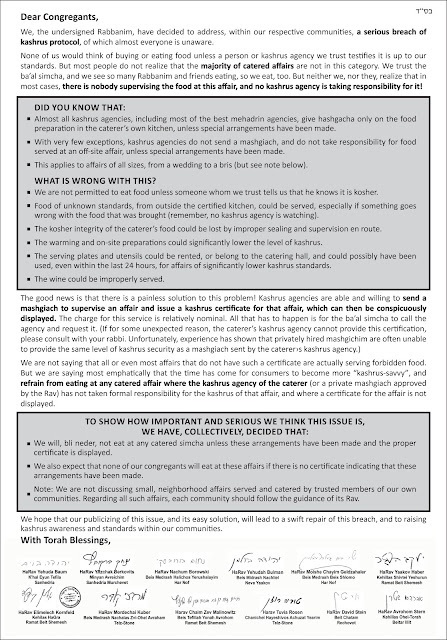 Very often, the baal simcha gets a caterer but there is no certification or supervision of the specific event. So, it turns out, even if the caterer is "Badatz" or "Rav Rubin" or under whatever other hechsher, there is no hechsher on the food served at the event. As soon as the food was removed from the caterers kitchen, unless there is additional supervision, which there generally is not, the event is not certified kosher. You are simply trusting the caterer, the waiters, and anybody else who has access to the food and utensils. This leaves an opening for all sorts of problems to rise that nobody might even be aware of. the guests, in this situation, chow down on the food, trusting the baal hasimcha to have provided a nice kosher, even mehadrin, dinner. Maybe they asked what hechsher and were told this or the other hechsher, but at the end of the day there is almost never a hechsher, and anything goes. 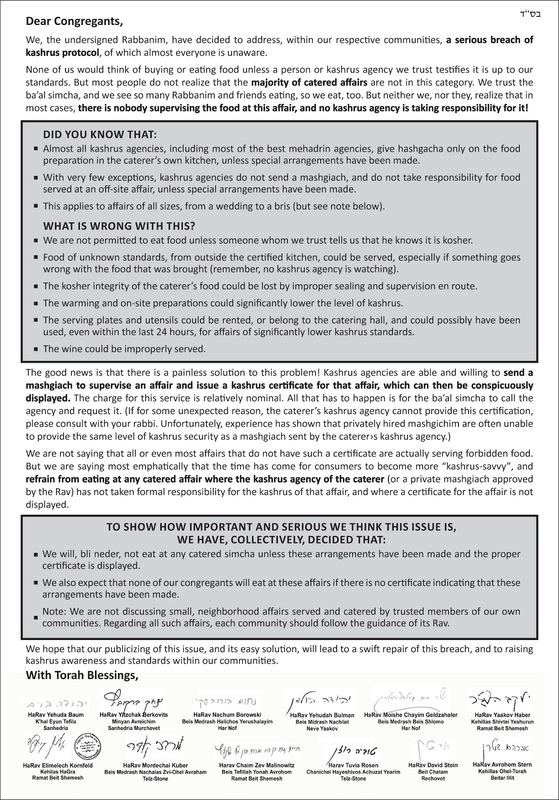 A group of community rabbis have signed a letter of commitment to raise awareness to this issue, by not eating at catered simchas that do not have arrangements for a mashgiach with a certificate on display. This will be promoted and encouraged in their communities and they hope the movement to demand this will grow. 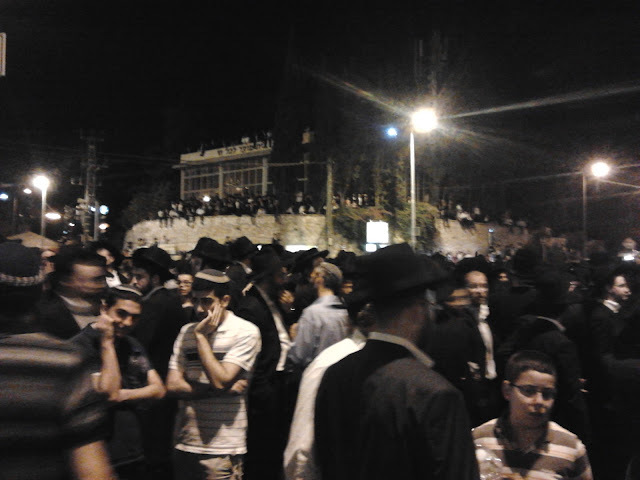 I went to the levaya of Rav Elyashiv last night. There was a very large crowd there, but ti seemed strange to me. It did not feel like a funeral. I've been to large funerals before - Rav Shlomo Zalman Auerbach's funeral supposedly had in the range of 600,000 people while the news is reporting between 250,000 and 300,000 at Rav Elyashiv's.. - so it was not the size. For some reason, all over, people were chatting, laughing, and having a good time, myself included, while waiting for the main part of the procession to approach. It seemed more like a large social gathering than a funeral. Here are some images I snapped with my cellphone at the funeral..
big crowds, people took up vantage points wherever they could, even on top of buildings..
this guy was bellowing out a call to donate tzedaka - screaming something in yiddishe about the decree of the draft. I am not sure why the possible draft has anything to do with tzedaka, but people were donating..